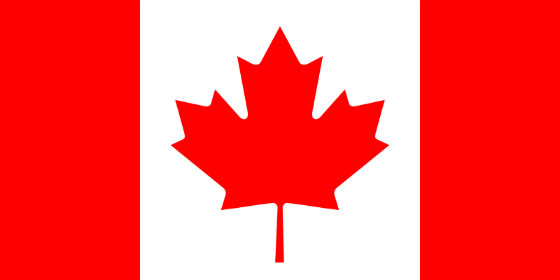 If you haven’t heard about Google AdWords’ new, free Android app, it might be because it’s only available in Canada. Users can also contact Google experts through an in-app support feature. Apparently, the app will roll out in other countries “soon”. Until then, those of us living outside of the Great White North will have to make do with the AdWords Express app, which has comparatively limited functionality. When you consider that Google AdWords received more than 200 updates last year, it’s easy to see why newcomers can find the platform daunting. There’s a lot to keep track of – even for seasoned PPC managers. To help users make sense of the constant stream of updates, Google has launched a ‘New AdWords Features’ page in Google AdWords’ help section. The new page, announced in an Inside AdWords blog post yesterday, takes the form of a month-by-month timeline, documenting new features and updates as they launch. In the same blog post, Google announced another set of help pages, designed to “[make] advertisers better at AdWords”. ‘Google Best Practices’ features advice and tips on subjects like ad copy creation and bid automation, “to help you get the most out of AdWords. Bing has added a new feature to its New Opportunities Tab, allowing users to optimise their bids on the back of competitor performance data. The new feature, dubbed Competitive Bid Opportunity, pulls in keywords that the advertiser and their competitor are bidding on, and shows the competitor’s impression share versus the advertiser’s. It also displays the advertiser’s current bid, and a suggested bid, and allows users to make changes to bids there and then. Users can select from a list of their ten top competitors to optimise against. Bing Ads will only offer the competitive bid opportunity when our data has determined that there is indeed an opportunity to attract more eligible impressions than the competing ad. If achieving this competitive edge requires an unreasonably large change or if the opportunity does not exist at all, competitive bid opportunity will not be shown in the opportunities at that time. Bing also points out that its estimates are based on past data, and are not intended as a prediction or guarantee for future keyword performance. The feature is currently available in the US only, but Bing says it will be rolling out in other markets. Google AdSense is soon to beta test a new ‘standard sensitive ad category’, allowing the promotion of ‘social casino games’ across the Google advertising network. …Simulated gambling games (including, without limitation, poker, slots, bingo, lotteries, sports betting, betting on races, as well as other card games and casino games) where there is no opportunity to win anything of value (such as money or prizes). Standard sensitive ad categories are opt-out only, meaning ads will be seeded out across the advertising network unless advertisers choose otherwise. The limited beta test will begin “around March”, and will be supported in English only. 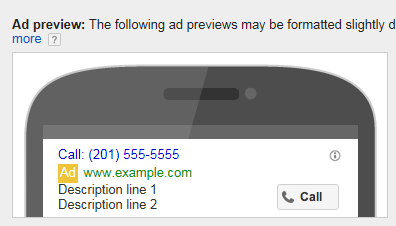 A new ad type has been quietly rolled out for AdWords, allowing mobile advertisers to easily create ads driven towards generating phone enquiries, without a website link. 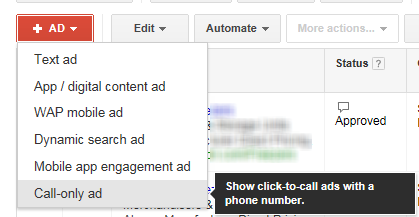 Call-only ads, first spotted by Philly Marketing Labs, drastically simplify the process of creating click-to-call ads without links. Previously, creating these ads involved a somewhat complicated manipulation of ad extensions. Users can include a business name, two lines of descriptive text, and a phone number – along with an optional verification URL. So we’d recommend including it, to be on the safe side. 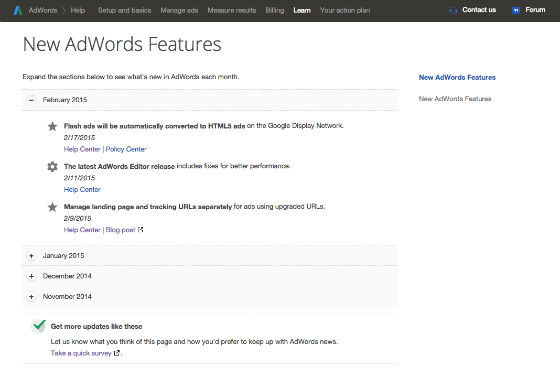 Google AdWords’ ‘Upgraded URLs’ have rolled out globally, after a long beta testing period. Upgraded URLs “provide an easier and faster way to manage and track important information about each click on your AdWords ads” writes Google, in its blog post announcing the launch. Essentially, the new URL format allows advertisers to update tracking information, without having to re-submit the ad for review (and thus potentially lose out on business). Google also says the update will reduce load and crawl times. For more information on implementing Upgraded URLs, see Google’s official launch post. Earlier this month, Bing rolled out a simplified, updated version of it quality score system. Will give new ads a quality score based on marketplace data. Previously, a quality score would only be assigned when an ad had been active for long enough for Bing to gather the necessary data. Simplifies reporting to reduce noise, so quality score is now reported “based on a mix of customers' search queries and other inputs that match your keyword exactly”. Brings terminology in line with industry standards. ‘Landing page relevance’ has changed to ‘ad relevance’, ‘landing page user experience’ has become ‘landing page experience’, and ‘keyword relevance’ is now ‘expected click-through rate’. Search interest for the term 'mother's day' over the last 30 days. Source: Google Trends. Mother’s Day is the US’s third-largest retail holiday. Search spend for Mother’s Day was 110% higher than for Father’s Day last year (?!). While 64% are shopping for their mums, nine per cent are shopping for their daughters, and 23% are shopping for their wives. Greeting cards, flowers and ‘special outings’ are the most popular Mother’s Day gifts. 30% of shoppers will buy presents online, and spend 38% more than their offline counterparts. Bing recommends pushing mobile on the week of Mother’s Day, as last-minute shoppers use their smartphone to find gifts. Searches for flowers and ‘bling for moms’ begin ramping up earlier than other Mother’s Day-related terms. Bear in mind, these insights are geared towards Mother’s Day in the US, which is on May 10. However, we reckon most of the insights are probably broadly applicable to the UK too. Over at BidCops: 3 Ways PPC Can Improve Your Content Marketing.